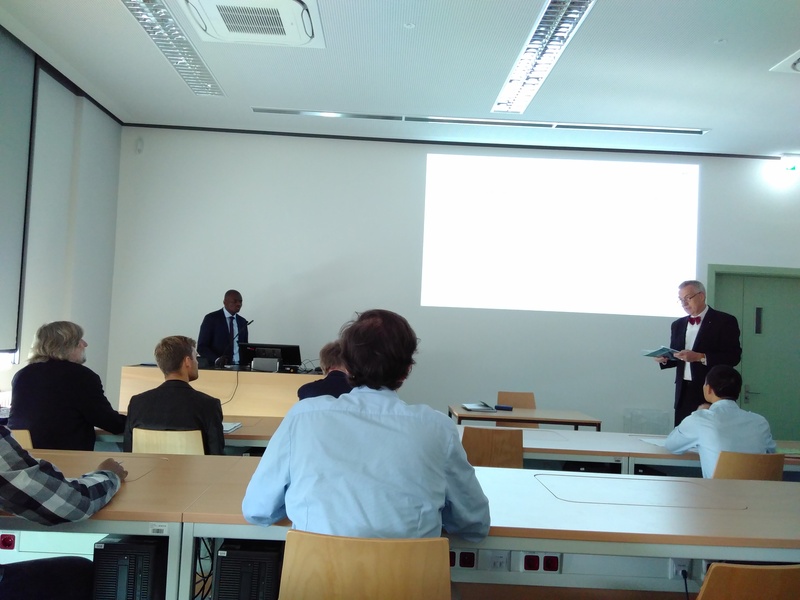 In the morning of September 10th 2018, Francis Moyo defended his doctoral thesis on “Community Based Conservation in Tanzania: Discourses and Realities”. The aim of his research was to investigate the socio-economic impacts of community-based conservation initiatives on rural livelihoods. His field research was conducted in Burunge Wildlife Management Area, a Tanzania’s flagship community-based conservation initiative for wildlife protection. 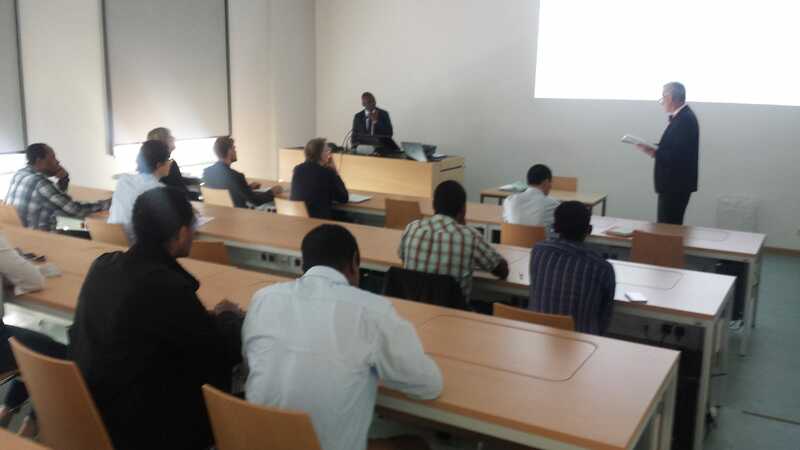 Francis Moyo’s research work was supervised by Prof. Pretzsch, the Institute of International Forestry and Forest Products at TU Dresden, Prof. Lund from the Department of Food and Resource Economics at University of Copenhagen, and Prof. Müller from Leibniz Institute of Ecological and Regional Planning – IOER. Additionally, Prof. Kapp from the Institute of International Forestry and Forest Products at TU Dresden served as a reviewer on the supervisory board. Prof. Erler from the Chair of Forest Technology chaired the defense, while our fellow doctoral student Tran Van Hiep did the protocol. The discussion part was tense with various questions on the co-management conservation approaches in times when demand for natural resources is deemed important for rural peoples’ efforts to move out of poverty. With confidence and expertise on the topic, Francis Moyo tackled these questions eloquently in a composed manner. Another evidence of his ‘bravery’ is reflected in his presentation. For those of us who attended his mock defense, it is clear to see the improvements he has made. In fact, for his defense presentation, it was the first time that he learned the animation function on PowerPoint and he nailed it! Francis also demonstrated that it is never too late to learn something new. In science, to be able to effectively convey the message to a larger audience is key. Francis’ passion and interest in wildlife management will not just end in his doctoral study. Working as a lecturer at the Nelson Mandela African Institute of Science and Technology and specializing on biodiversity and conservation management, he will continue working at what he does best. At the end of September, he will return to his home country, Tanzania, where the next mission awaits: He will carry on educating the local communities in wildlife prone villages. This is an extension of his project, funded by the Rufford Foundation (https://www.rufford.org/projects/francis_moyo_1). Following this milestone event, the attendees enjoyed a nice post-defense celebration. A round of toast and testimonies from his supervisors to celebrate Francis’ success followed the defense. As a tradition at the Chair of Tropical Forestry, Francis had to undergo the last (informal) step in his defense, namely the “curiosum” and the handing of the legendary hat. The curiosum is the fun quiz prepared by the colleagues, filled with pictures throughout the candidate’s time as a Ph.D. student. As for the hat, Francis is the second signatory on the hat this year after Maxi Domke. At the tip of his defense is joint lunch at the institute. Good food and a nice atmosphere were had by all. On behalf of the whole member of the Chair of Tropical Forestry, we congratulate Francis Moyo for earning the Dr. rer. silv. degree and we wish him all the best in his career path and applying his passion and expertise in conservation and development.